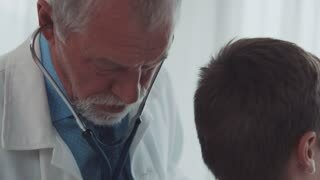 Search Results for "child back doctor"
A little boy is sitting in a chair in the doctor's office, he is afraid and turned his back to the doctor. Portrait of a cute child at a doctor's reception. 1960s: Woman cries. Nurse cleans child's wounds with gauze. Doctor smiles and speaks. Woman chokes back tears and nods. Doctor fixing special treatment tape on the child back. 1930s: Man sits in wicker chair. The back of man's head. Child with injuries across face. Drawing of knight standing behind doctor looking into microscope. Pamphlets on fighting diseases. Senior doctor examining a small boy in his office. 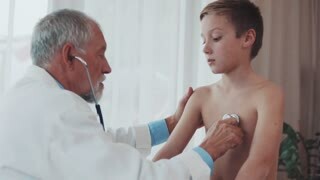 A doctor listens to a gradeschoolers chest with a stethoscope. 4K. Paediatric nurse or doctor with child isolated on white. Female doctor or nurse examining a baby by stethoscope. Conception paediatric.